Slacklining refers to balancing, walking or jumping on a line tensioned between two anchors (trees, for example). 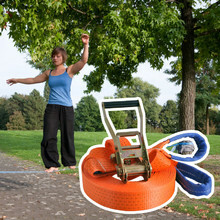 In contrast to tightrope walking, the line used for slacklining is not perfectly tight, but almost flexible. The origins of this new activity can be traced to Yosemite, where climbers passed the time by walking on chains near local parking lots. 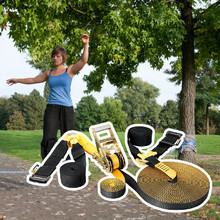 In this category, you’ll find slacklining sets from Singing Rock, a renowned manufacturer guaranteeing the highest comfort and durability.